Review Summary: On the whole PYAAR ISHQ AUR MOHABBAT is too weak a film to leave any impression whatsoever. On the whole PYAAR ISHQ AUR MOHABBAT is too weak a film to leave any impression whatsoever. 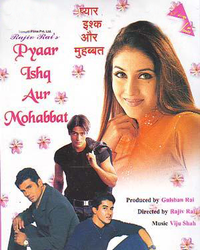 Pyaar Ishq Aur Mohabbat is the story of three men and a pig-headed girl. A tacky copy of the Hollywood hit film There`s Something About Mary, Rajiv Rai`s Pyaar Ishq Aur Mohabbat is inspired to an extent from the original version, but the desi version leaves much to be desired.